After meeting up with highschool friends Rady, Jojo, Alfonso, Roy and Joca in Pangasinan, I went up to Baguio City wee hours of February 24 and arrived at 3:30AM. I stayed with my friend Fidel Castro, not the Cuban President, to get a short sleep. I went to Magsaysay Avenue and positioned myself at the overpass which was jam-packed with so many spectators who were ready to catch a glimpse of the parade of flowers. The people braved the drizzles and it had not dampened their moods to witness the float parade. 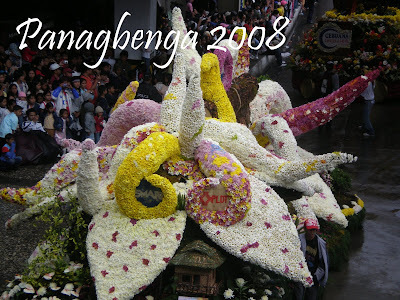 This is the 13th Panagbenga Flower Festival celebration in Baguio City and adopted the theme “Celebrating 13 Years of Caring.” Panagbenga is a kankanaey term that would mean a time to bloom or season of blooming. Around 30 floats were paraded that include the Chowking, SM, the winner San Miguel Foods, Jollibee as second and many others. After the parade, I went to attend a mass at the Baguio Cathedral and proceeded to SM City where I met up with friend Cherrie Reyes. She took me to the art gallery café Oh My Gulay owned and created by artist Kidlat Tahimik. It was a fanstastic showcase of arts, designs and paintings. We dined in with lumpia and Alfesto Pasta. Cherrie gave me a souvenir dream catcher which can be bought inside. I took my Nanay Loreta, Sister Arlene and nieces Kim, Yna and nephew Aldrin to a family weekend to everything that flies on the 12th Philippine International Hot Air Balloon Fiesta. We dropped by at SM City Clark, from there we took the free shuttle service to the site. There was a Php100 entrance ticket per person. Children of ages 4 years old and below are free of charge. We were not lucky to see the 21 hot air balloons to fly into the air since it’s so windy that day. We just watched the kite flying exhibition, the radio controlled light aircraft exhibition, the balloon bursting competition and visited the booths on fair. The Kalayaan Philippines of Hawaii had a night of affair at the Laoag Amphitheater on February 05, 2008 in celebration of the Pamulinawen Festival. They invited the group Tawid for Christ International to render a performance on that affair. The guest of honor was Former First Lady Imelda Marcos. The group Tawid has been organized 15 years ago by Mrs. Porfiria Raval, Music Supervisor of then DECS of Ilocos Norte. Members came from the different disciplines of the Ilocos community. 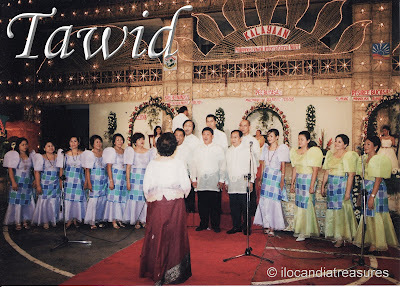 The group originally started with the name Choir for Christ since they sing gospel songs, later renamed as Tawid Choir since they sing Ilocano songs and currently carries its official name. They had performed several times on invitations locally and internationally such as in the United States and Hongkong. I was invited by Mrs Raval to join the group to serve as bass, on December 2007 with some rehearsals. The said affair was my debut performance with the group. We sang medley of Ilocano songs such as Manang Biday, Dungdunguen Ka, No Duaduaem and You are the Sunshine of My Life. Yantangay siksika ti innak ay-ayaten.